Fear of a massive hemorrhage makes Jarrett a dull boy. Ok, I’ve changed my mind. TBI is…Topic not about Brain Injury. Allow me to discuss with you, dear readers, the racket that is “Skylanders: Giants”. Listen, my daughter loves boy stuff. McDonald’s mistakenly put a girl toy in her happy meal once and I’m pretty sure she wrote to congress about it. Skylanders: Giants is a video game where you walk around “Skyland,” squash bad guys and collect loot. Here is a trailer. The “racket” I’m referring to is the fact that the game doesn’t work unless you have a “portal of power” and a Skylander to place onto that portal. The “starter pack” provides the game, portal and three Skylanders. I propose that the “starter pack” be renamed the “gateway pack” because once a kid starts, it becomes a feverish addiction. You see, by placing a Skylander on the portal of power, that character enters the game as a playable, uhh…character. In essence, the game is never complete – there are always more Skylanders. Truly, there are. The creators have it all thought out, just when you think you have all 816 characters, they release the “Skylanders: Kitchen Staff” characters. Ever wonder what Tree Rex eats? How did Swarm get so big? See what’s cookin with the new “Skylanders: Kitchen Staff” figurines. Collect all 378! Over the weekend, Q was walking around inspecting my apartment to find chores so that she could earn more Skylanders. When I was a boy, it was enough that you purchased a game; end of transaction. One more thing – TidBit of Information, clever, no? 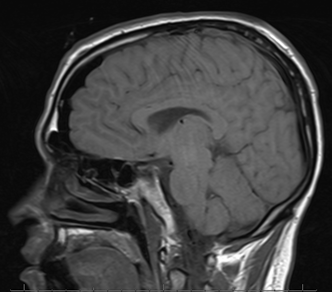 I finally requested my MRI scans from UT Southwestern. At first they said no, then I said please and NO ONE, not even fancy hospitals can deny a request when you utter the magic word. Moving on, I received said scans in the mail a few days ago and have selected a few to show you. This first one was done on the 24th of May, in that foul year of our Lord, 2009. 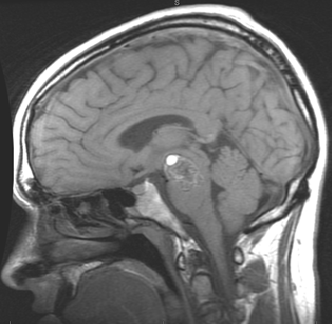 The white spot on my brainstem is White Out (this blog brought to you by Bic). My hands were all wet one day and I needed to write something down (I needed more toilet paper, I think). The next best place to scribble a quick note? Obviously, the brainstem. After I got TP I didn’t need the note anymore so I whited it out. The next scan was taken on the 4th of September, in that foul year of our Lord, 2009. This was the day after the cavernoma was removed. Squeaky clean, no? One Pair of Glasses to Rule Them All! Let me start by saying thank you for your comment. Now, I must know how you don’t know how to correctly spell your favorite nephew’s name. What’s more, the correct spelling of my name is clearly visible on the URL bar.